Welding has its roots in ancient times when people began attempting to control fire in order to join and solder metals. After electrical power was developed, the technology was adapted to welding torches for cleaner, more controlled welds. While gas shielding and flux had been experimented with since around the beginning of the 1900’s, GMAW, MIG, and TIG welding would not be developed until the 1940’s. FCAW would be developed and patented a decade later. 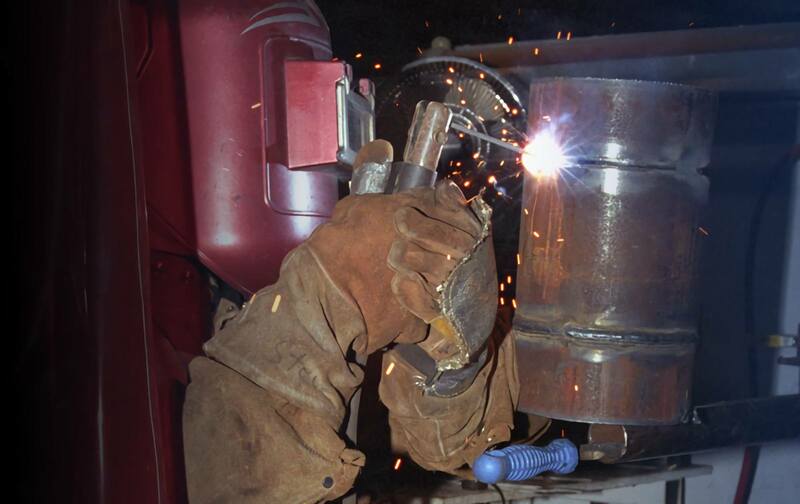 Since their invention, these welding techniques were adjusted and improved until they eventually led to welding torches and equipment that could produce hotter flames, be more easily and reliably controlled, and be used for a greater variety of applications. MIG welding is a relatively fast form of welding that is fairly simple to learn in welder training and doesn’t demand too much skill after the proper settings are made to the torch and wire feeder. It can also be used from any position and produces a clean joint without slag. MIG is most often used in high production welding operations, such as in shops and factories. Indoor factory environments are ideal for MIG because MIG welding requires clean surfaces and windless conditions (otherwise the gas shielding will be disrupted, allowing reactions and imperfections in the weld). TIG is a harder process to master because instead of the wire automatically feeding into the weld joint, the welder must continuously hand-feed a separate rod into the molten pool of the base metal. While TIG welding takes longer to master, it produces extremely high-quality welds. It can also be used on a diverse range of metals. Because it is a very precise technique, it can be used on thin metals (such as sheets of aluminum) and in projects that require small welds. SMAW is a more rugged form of welding. It produces slag that must be cleaned up immediately after the weld is finished, and it does not handle as well on thin metals (under 1/8”). However, it is more forgiving in terms of surface conditions (able to work on painted or rusted surfaces), and it can be used outdoors to great effect. This makes it ideal for outdoor uses, such as on farms and for repairing equipment in the field. Fluxcore arc welding is essentially MIG welding with a specialized wire. The flux core is a tubular wire filled with “flux,” which vaporizes when it contacts the hot weld joint and releases a shielding gas. This self-shielding characteristic allows it to be used outdoors and with less stringent surface preparation requirements than MIG welding . For these reasons, it is sometimes used as a replacement for MIG welding in outdoor settings. It can also be used with an external shielding gas (as in MIG welding), producing dual shielding for increased protection against impurities. However, like stick welding, fluxcore welding produces slag that has to be removed before paint can be applied. To learn more about different types of welding and gain the skills necessary to start a career as a welding professional, contact Tulsa Welding School. By enrolling in the Professional Welder training program in Florida or Oklahoma, students are setting themselves up for a career in the skilled trades with skills that are transferrable to jobs across the country.